As a huge animal lover I am mainly against wearing animal skin or fur. I just love to choose ‘faux’ when it comes to fabric and material. 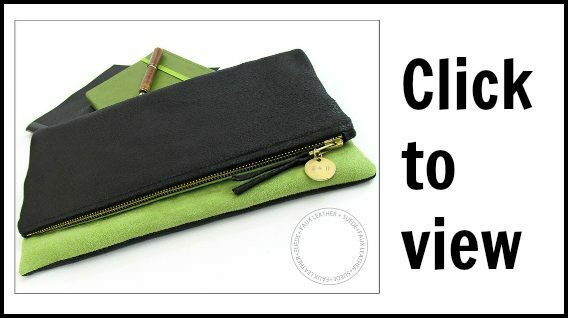 See my 8 tips for sewing with faux suede. 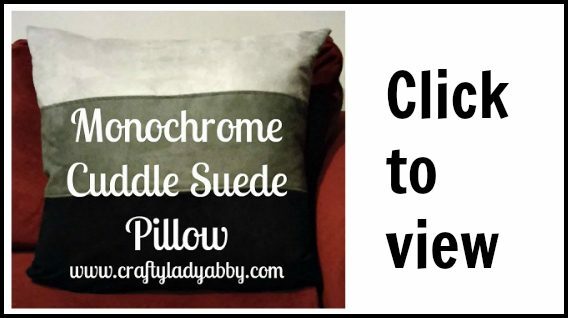 I love working with Shannon Fabrics which is mainly known for their amazing Cuddle Fabric but they also offer other types of fabric such as faux suede which they call Cuddle Suede. I have received this sumptuous suede in gold (they don’t carry this color anymore but you can find other company’s faux suede fabric here). I had so many ideas floating around in my head and finally picked a project. 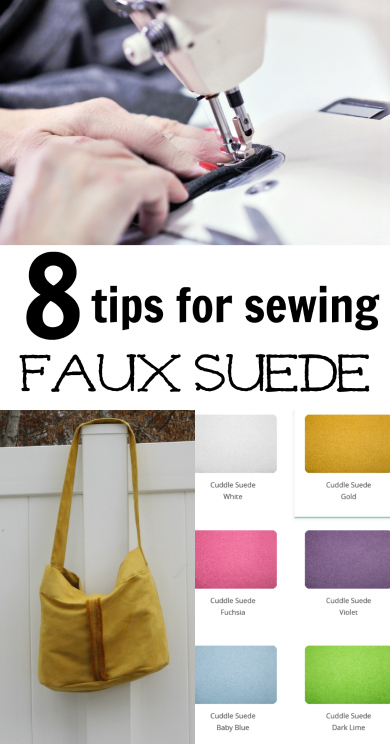 But first, here are my 8 Tips for sewing faux suede. If you haven’t worked with faux suede, you really should. It is amazing and really not difficult to sew at all. Here are some important factors and tips to ensure your results will be pleasing. I made the slouchy hobo bag in the image above. See the free faux suede hobo bag pattern post! Synthetic suede fabric varies in fiber content and structure and often has a velvety texture. This makes out the price difference. You can mostly fine polyester or poly/mix and some suedes are manufactured as none-woven which makes for the appearance of a nap like leather suede typically has. A cheaper version of synthetic suede is made with a knit cloth base. You can find synthetic suede fabric in two different weights. The lightweight version is drapeable and well suitable for clothing such as blouses, dresses and works well when ruffled. The second one is stiffer with a crisp texture and the drape is not well suited for soft, flowy blouses but more for coats, skirts, bags etc. Since some synthetic suedes often need interfacing to make clothing easier to put on as it won’t slide well due to the nap. Any lightweight polyester or silky material will be great as lining as it provides the necessary smoothness for dressing and wearing. You can also use fusible interfacing on synthetic suedes on projects such as bags, purses etc. Always test how well the interfacing works on your particular suede before applying it to the entire project. It’s best to preshrink all your fabric including your lining. Best is to follow the instruction of your material. You can use fabric softener when washing synthetic suede but it not recommended to use dryer sheets when drying the fabric as residue could stain the suede permanently. To prevent your interfacing from shrinking, you want to use a plastic bowl with hot water and only pat it dry with a towel and let it air dry by laying it flat on a dry towel. Interfacing won’t hold up in the dryer though. Don’t iron! As well as with flannel, you want to press your synthetic suede to remove wrinkles. The same goes for the lining. Since synthetic suede has a nap you want to decide if you want your project to have the nap going up or down. If the nap goes up, your material will have a darker, richer color and if the nap goes down, it will look lighter. If you are using templates to cut out your fabric you want to hold down the templates with weights. You could test on a small piece if pinning with straight pins won’t damage the material. Tiny holes may come out when pressing with a steaming iron. If your pattern calls for folding the fabric over, fold it with right sides out. Use sharp fabric scissors. To continue please click on page 2 below! Thanks for linking u pro our party and for including my bag in your post. That was my first time working with faux suede and I really liked it. I am definitely going to be using it again. Thanks! I bought some faux suede for to make a bag and this tips are very helpful. So happy to hear my tips might help you along the way! Let me know how it goes! Glad to know you can use these tips!! Thanks for visiting! I am making an ultra suede jacket, how do I hem it at the hemline? I am making pillows from a faux suede skirt (yes, really). This skirt is gored so cutting is a problem.. Question: If this doesn’t have a grain, can I cut it any way I need to in order to get a 14×14 pillow front? It probably depends more on the length of the fur. I’d probably cut it anyway I could for a pillow. You can always pull out the fur from the seams later on. I’m trying to sew faux suede and it’s shredding when I try to turn it right side out.. am I using too small of a stitch? Excessive shedding is normal. Keep working on your project and at the end, just pick the lose fur off. Thanks for visiting today!